Worsening renal function during treatment of acute decompensated heart failure (ADHF) often complicates the treatment course of heart failure. Furthermore, the development of worsening renal function is a strong independent predictor of long-term adverse outcomes. Sometimes referred to as ‘cardiorenal syndrome,’ the definition varies widely, and the overall understanding of pathogenesis is limited. This is probably owing to the lack of precision and characterisation of renal compromise during treatment of heart failure. Traditionally, the predominant cause has been attributed to impairment of cardiac output and relative underfilling of arterial perfusion. Emerging data have led to a resurgence of interest in the importance of venous congestion and elevated intra-abdominal pressure rather than confining it to impaired forward cardiac output as the primary driver of renal impairment. These revived concepts may support the role of novel renal-sparing approaches to salt and water removal and renal preservation, but better ways to distinguish haemodynamic versus other nephrotoxic aetiologies are needed. The complex interactions between the failing heart and the kidneys in regulating salt and water balance still puzzle cardiologists and nephrologists alike. This is in part owing to the imprecise nomenclature, but clearly the ability to sustain the filtration and tubular functions of the kidneys by therapeutic interventions is vital to successful alleviation of congestion. In the setting of decompensated heart failure, coexisting renal insufficiency often complicates the treatment course. This paper describes the contemporary pathophysiological insights of the so-called ‘cardiorenal syndrome’ and worsening renal function in congested patients receiving treatment, with specific discussions about present and future strategies aiming to achieve renal preservation in the acute decompensated heart failure (ADHF) setting. The conceptual term ‘cardiorenal syndrome’ has been used to describe a wide variety of clinical settings involving concomitant impairment of cardiac and renal function. However, the strict definition describes the condition whereby treatment to relieve congestive symptoms of heart failure is limited by further decline in renal function (box 1).1 Some investigators have even proposed classification schemes2 3 despite the fact that there is no universally accepted definition. The epidemiology and definition of the cardiorenal syndrome are also not well defined. However, we recognised that a subset of patients admitted with ADHF may fulfil a more concrete and quantitative description of the cardiorenal syndrome characterised as an 0.3–0.5 mg/dl rise in serum creatinine or a decrease in glomerular filtration rate (GFR) of 9–15 ml/min during ADHF admission.4 5 This is often referred to as ‘worsening renal function,’ and has been used in most outcomes research studies. There are reasons to expand our vantage point beyond assessing glomerular filtration. In fact, impaired tubular function due to a wide variety of reasons may be far more detrimental to the ability of the kidney to maintain adequate fluid and salt balance. Traditionally, blood urea nitrogen (BUN) has not played a major diagnostic role in cardiorenal syndrome because of the dependency of BUN levels on extrarenal factors such as protein intake, catabolism and tubular reabsorption efficiency. An increased ratio of BUN-to-creatinine is often suggestive of pre-renal azotaemia, which may warrant adjustment of diuretic regimens. Recent data from the ADHERE Registry suggested admission BUN as one of the strongest predictors of in-hospital mortality,12 and post hoc analysis of several clinical trials and cohort databases also indicate the importance of linking BUN (baseline or rise during treatment) to poor short- and long-term outcomes.13–15 Refractory hyponatraemia despite diuretic treatment is another important indicator for the kidney's inability to compensate for the volume expansion regardless of cardiac output, and can be a potential indication of underlying diuretic resistance. Many of these adverse effects have been attributed to overzealous intravascular volume depletion leading to activation of neurohormonal systems.16 However, direct proof is lacking as most mechanistic demonstrations predated the use of neurohormonal antagonists. Only resolution of fluid retention has been associated with reduction in neurohormonal levels in patients with advanced heart failure.17 Other renal abnormalities affected by heart failure or its diuretic treatment include the development of secondary hyperaldosteronism, micronutrient deficiency and electrolyte abnormalities—all may lead to progressive clinical deterioration. The exact pathophysiological mechanism(s) responsible for cardiorenal syndrome and worsening renal function are multifactorial and not well defined. An overall imbalance in interactions between the failing heart, neurohormonal system and inflammatory responses has been implicated. All of which, in a vicious cycle, have been postulated to cause structural and functional damage to the kidneys and the heart. Several haemodynamic factors influencing the development of cardiorenal syndrome and worsening renal function during ADHF include (a) the adequacy of arterial filling and renal perfusion; (b) degree of venous congestion; (c) presence of raised intra-abdominal pressure. Pathophysiology of cardiorenal syndrome. AVP, arginine vasopressin; RAAS, renin–angiotensin–aldosterone system; RV, right ventricle, SNS, sympathetic nervous system. We now recognise that the presence of low cardiac output in ADHF can only explain part of the pathophysiology. Recent data from large registries argue against diminished forward flow to renal arteries as the sole culprit for the pathogenesis of cardiorenal syndrome. Clinically, the proportion of patients presenting with heart failure caused by diminished filling of the renal vasculature as a result of low cardiac output is relatively small. In most cases, the reduced renal blood flow caused by circulatory impairment promptly leads to compensatory increase in filtration fraction, which preserves the GFR and also more than offsets any reduction in renal blood flow. It is only in more severe heart failure with extremely high renal vascular resistance (caused by the activation of the neurohormonal axis) and markedly diminished renal blood flow, that GFR falls markedly without further increase in filtration fraction.18 Two recent observations from ADHERE may also support this notion: (a) the incidence of worsening renal function was similar among patients with ADHF and reduced versus preserved systolic function (the latter often presents with increased left ventricular impedance rather than impaired cardiac output)22; (b) most patients with ADHF present with elevated, rather than low systemic blood pressure.23 It is important to re-emphasise that diminished renal blood flow may still contribute to worsening renal function, as patients with progressive pump failure or cardiogenic shock often develop progressive renal impairment that is reversible with advanced support or even renal replacement treatments. In larger and more contemporary clinical experience, increased central venous pressure (CVP) had the strongest association with reduced GFR in patients with pulmonary hypertension as well as in those with cardiovascular diseases, particularly in those with evidence of low renal blood flow.27–29 With the kidney being an encapsulated organ, it was thought that increased venous pressure might distend the venules surrounding the distal ends of the tubules so that the lumen of the tubule could be obliterated until the pressure of the fluid within it exceeded that in the vein.24 Others simply postulated that increased CVP could be transmitted backwards to the renal veins and cause an increase in renal interstitial pressure.30–32 This may lead to a hypoxic state (ischaemia) of the renal parenchyma similar to the mechanism by which hepatic congestion leads to liver failure in heart failure.33 Furthermore, intrarenal but also systemic angiotensin II concentrations may increase with increasing renal venous pressure.31 34 This will lead to a further fall in GFR and will increase sympathetic system activity.35 36 Finally, counter-regulatory mechanisms to decrease sensitivity of the tubuloglomerular feedback may be blunted in heart failure, thereby compromising the maintenance of GFR.37 The combination of such haemodynamic and neurohormonal alterations induced by venous congestion will ultimately lead to a downward spiralling of renal function. Three major therapeutic goals have evolved in the contemporary and future management of cardiorenal syndrome during admission for ADHF: (a) to avoid causing short-term harm with existing ADHF treatments; (b) to augment surveillance of (and to identify those at risk for) cardiorenal dysfunction; (c) to develop renal-preserving treatments. We will elaborate on these specific goals. During intensive medical treatment with intravenous loop diuretics, GFR is often reduced owing to alterations of the delicate balance between intra- and extrarenal haemodynamics. Compartmentalisation of fluid retention must therefore play a role when the primary task of loop diuretics is to deplete sodium (and subsequent fluid) while relying on the refilling from extravascular sources. Therefore, treatments that fail to reduce the kidney congestion will probably aggravate or induce progressive renal dysfunction. Aggressive intravenous loop diuretic infusion tailored to decrease venous congestion and maximise urine flow and effective volume loss results in improved haemodynamics and heart failure symptoms and normalises renal function in most cases.28 Also, the Evaluation Study of Congestive Heart Failure and Pulmonary Artery Catheterization Effectiveness (ESCAPE) trial has shown that renal function did not worsen when treatment was directed at lowering invasively measured CVP and pulmonary capillary wedge pressure, while it did worsen in the treatment arm guided by clinical assessment alone.43 44 A delicate balance of facilitating the consistent refill of intravascular volume removed by loop diuretic treatment from extravascular compartments is necessary to maintain renal perfusion and filtration. Vasopressin receptor antagonists have attracted much attention with their potential to achieve fluid removal in the absence of excessive electrolyte disturbance. Early studies demonstrated dose-dependent, short-term increase in urine volume and weight loss, but their long-term incremental benefits were not demonstrated in a large-scale multicentre study.53 Still, if approved, this drug class may provide an alternative treatment option for fluid management, and may be useful in certain clinical scenarios (such as those with significant hyponatraemia or those with congestive states and fluctuating electrolyte disturbances on standard diuretic regimen). While vasopressin receptor antagonists inhibit primarily water reabsorption in the distal tubule leading to aquaresis (hypotonic fluid), other treatments like ultrafiltration remove more isotonic fluid and can relieve congestion without using the kidneys. This is particularly relevant when significant venous congestion and/or arterial underfilling may prohibit effective salt and water removal from loop diuretics. Results from a multicentre clinical trial have suggested that patients admitted for ADHF treated with ultrafiltration may have greater weight and fluid loss than with intravenous diuretics alone, and were associated with a reduction in 90-day resource utilisation for heart failure.54 However, there are clear barriers to the broad adoption of clinical ultrafiltration, including its invasiveness and cost. Most attention has focused on the potentially ‘renal-sparing’ role of synthetic natriuretic peptides or other drug classes in the treatment of ADHF. Clinical trials have demonstrated the efficacy of nesiritide in improving haemodynamic parameters and symptoms.55 56 Although there might be a modest natriuretic and diuretic effect with the drug, nesiritide treatment does not obviate the need for concurrent diuretic treatment.56 There have been concerns about renal insufficiency and even mortality at the expense of short-term symptomatic relief, although broader clinical experience has attributed such risks to avoidable hypotension associated with overzealous treatment. New-generation compounds like the adenosine A1 receptor blockers not only inhibit sodium reabsorption but also reverse the afferent arteriole vasoconstriction and underfilling, leading to improved natriuresis and diuresis.57 58 Novel devices that directly deliver drugs to the renal arteries or ameliorate excessive renal sympathetic drive are also promising in early clinical investigations. Understanding the role of all these new, promising, but expensive treatments will require greater insight into the pathophysiology underlying the cardiorenal interactions. Therapeutic strategies used to treat ADHF have been largely unchanged over the past few decades especially in relation to preserving cardiorenal interactions. Recognising that worsening renal function is an important and prevalent adverse outcome in ADHF with a complex pathophysiology, careful re-evaluation of important contributing factors and technological advances to characterise, as well as deliver, appropriate interventions may lead to safer and more effective ways to relieve congestion and improve haemodynamics. Cardio-renal connections in heart failure and cardiovascular disease, national heart, lung and blood institute working group report. http://www.nhlbi.nih.gov/meetings/workshopscardiorenal-hf-hd.htm. 2004.
. Cardiorenal syndrome. J Am Coll Cardiol 2008;52:1527–39.
. Cardiorenal and renocardiac syndromes: the need for a comprehensive classification and consensus. Nat Clin Pract Nephrol 2008;4:310–1.
. Worsening renal function and prognosis in heart failure: systematic review and meta-analysis. J Card Fail 2007;13:599–608.
. The prognostic importance of different definitions of worsening renal function in congestive heart failure. J Card Fail 2002;8:136–41.
. Incidence, predictors at admission, and impact of worsening renal function among patients hospitalized with heart failure. J Am Coll Cardiol 2004;43:61–7.
. Renal function, neurohormonal activation, and survival in patients with chronic heart failure. Circulation 2000;102:203–10.
. Correlates and impact on outcomes of worsening renal function in patients > or =65 years of age with heart failure. Am J Cardiol 2000;85:1110–3.
. Prevalence and impact of worsening renal function in patients hospitalized with decompensated heart failure: results of the prospective outcomes study in heart failure (POSH). Eur Heart J 2006;27:1216–22.
. High prevalence of renal dysfunction and its impact on outcome in 118,465 patients hospitalized with acute decompensated heart failure: a report from the ADHERE database. J Card Fail 2007;13:422–30.
. Prevalence and significance of unrecognized renal insufficiency in patients with heart failure. Eur Heart J 2008;29:1029–36.
. Risk stratification for in-hospital mortality in acutely decompensated heart failure: classification and regression tree analysis. JAMA 2005;293:572–80.
. Prognostic value of blood urea nitrogen in patients hospitalized with worsening heart failure: insights from the Acute and Chronic Therapeutic Impact of a Vasopressin Antagonist in Chronic Heart Failure (ACTIV in CHF) study. J Card Fail 2007;13:360–4.
. Admission or changes in renal function during hospitalization for worsening heart failure predict postdischarge survial: results from the Outcomes of a Prospective Trial of Intravenous Milrinone for Exacerbations of Chronic Heart Failure (OPTIME-CHF). Circ Heart Fail 2008;1:25–33.
. Comparison of prognostic significance of amino-terminal pro-brain natriuretic Peptide versus blood urea nitrogen for predicting events in patients hospitalized for heart failure. Am J Cardiol 2007;99:1143–5.
. Blood urea nitrogen and serum creatinine: Not married in heart failure. Circ Heart Fail 2008;1:2–5.
. Neurohormonal activation rapidly decreases after intravenous therapy with diuretics and vasodilators for class IV heart failure. J Am Coll Cardiol 2002;39:1623–9.
. Role of the kidney in congestive heart failure. Relationship of cardiac index to kidney function. Drugs 1990;39 (Suppl 4):10–21; [discussion: 2–4].
. Hormones and hemodynamics in heart failure. N Engl J Med 1999;341:577–85.
. Pathogenesis of sodium and water retention in high-output and low-output cardiac failure, nephrotic syndrome, cirrhosis, and pregnancy (1). N Engl J Med 1988;319:1065–72.
. Isolation of "myocardial depressant factor(s)" from the ultrafiltrate of heart failure patients with acute renal failure. ASAIO J 1996;42:M911–5.
. Clinical presentation, management, and in-hospital outcomes of patients admitted with acute decompensated heart failure with preserved systolic function: a report from the Acute Decompensated Heart Failure National Registry (ADHERE) Database. J Am Coll Cardiol 2006;47:76–84.
. Characteristics and outcomes of patients hospitalized for heart failure in the United States: rationale, design, and preliminary observations from the first 100,000 cases in the Acute Decompensated Heart Failure National Registry (ADHERE). Am Heart J 2005;149:209–16.
. The influence of venous pressure on the isolated mammalian kidney. J Physiol 1931;72:49–61.
. Renal interstitial pressure and sodium excretion during renal vein constriction. 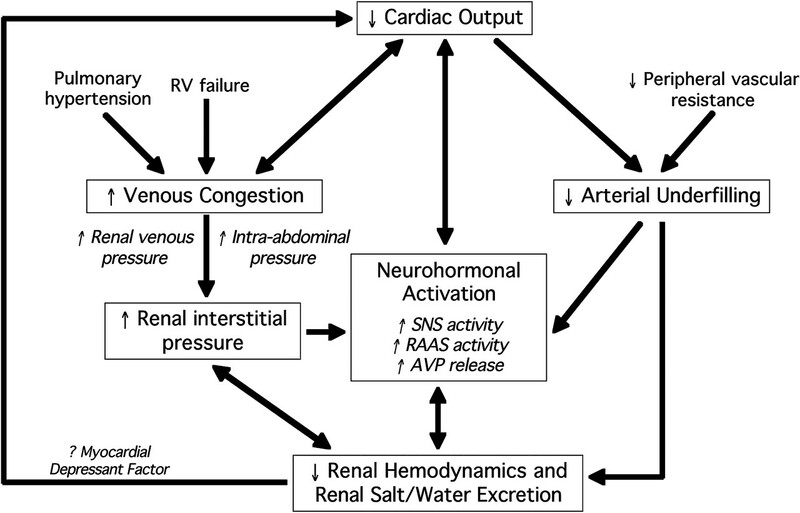 Am J Physiol 1980;238:F279–82.
. Intrarenal regulatory factors of salt excretion during renal venous pressure elevation. Am J Physiol 1969;216:1517–24.
. Importance of venous congestion for worsening of renal function in advanced decompensated heart failure. J Am Coll Cardiol 2009;53:589–96.
. Decreased cardiac output, venous congestion and the association with renal impairment in patients with cardiac dysfunction. Eur J Heart Fail 2007;9:872–8.
. Increased central venous pressure is associated with impaired renal function and mortality in a broad spectrum of patients with cardiovascular disease. J Am Coll Cardiol 2009;53:582–8.
. Renal effects of prostaglandin inhibition during increases in renal venous pressure. Am J Physiol 1991;260:F525–9.
. Renal effects of angiotensin II inhibition during increases in renal venous pressure. Hypertension 1992;19:II137–41.
. Renal venous pressure in chronic congestive heart failure. J Clin Invest 1950;29:342–8.
. Ischemic hepatitis: clinical presentation and pathogenesis. Am J Med 2000;109:109–13.
. Renal hemodynamic responses to increased renal venous pressure: role of angiotensin II. Am J Physiol 1982;243:F260–4.
. Neural control of renal function. Physiol Rev 1997;77:75–197.
. Role of renal sympathetic nerves in mediating hypoperfusion of renal cortical microcirculation in experimental congestive heart failure and acute extracellular fluid volume depletion. J Clin Invest 1985;76:1913–20.
. Renal institial pressure andtubuloglomerular feedback control in rats during infusion of atrial natriuretic peptide (ANP). Acta Physiol Scand 1992;146:393–8.
. Intra-abdominal hypertension in the critically ill: it is time to pay attention. Curr Opin Crit Care 2005;11:156–71.
. The effect of increased intra-abdominal pressure on renal function in man. J Clin Invest 1947;26:1010–22.
. Effect of intravenous renal venous pressure on renal function. J Trauma 1999;47:1000–3.
. Elevated intra-abdominal pressure in acute decompensated heart failure: a potential contributor to worsening renal function? J Am Coll Cardiol 2008;51:300–6.
. Prompt reduction in intra-abdominal pressure following large-volume mechanical fluid removal improves renal insufficiency in refractory decompensated heart failure. J Card Fail 2008;14:508–14.
. Evaluation study of congestive heart failure and pulmonary artery catheterization effectiveness: the ESCAPE trial. JAMA 2005;294:1625–33.
. Cardiorenal interactions: insights from the ESCAPE trial. J Am Coll Cardiol 2008;51:1268–74.
. Worsening renal function: what is a clinically meaningful change in creatinine during hospitalization with heart failure? J Card Fail 2003;9:13–25.
. Renal dysfunction, as measured by the modification of diet in renal disease equations, and outcome in patients with advanced heart failure. Eur Heart J 2007;28:3027–33.
. Amino-terminal pro-brain natriuretic Peptide, renal function, and outcomes in acute heart failure: redefining the cardiorenal interaction? J Am Coll Cardiol 2006;48:1621–7.
. Prognostic value of cystatin C in acute heart failure in relation to other markers of renal function and NT-proBNP. Eur Heart J 2007;28:1841–7.
. Urinary neutrophil gelatinase associated lipocalin (NGAL), a marker of tubular damage, is increased in patients with chronic heart failure. Eur J Heart Fail 2008;10:997–1000.
. Randomized controlled trial of an implantable continuous hemodynamic monitor in patients with advanced heart failure: the COMPASS-HF study. J Am Coll Cardiol 2008;51:1073–9.
. Differential effects between intravenous and targeted renal delivery of fenoldopam on renal function and blood pressure in patients undergoing cardiac catheterization. Am J Cardiol 2006;97:1076–81.
. Severe renal dysfunction complicating cardiogenic shock is not a contraindication to mechanical support as a bridge to cardiac transplantation. J Am Coll Cardiol 2003;41:381–5.
. Efffects of oral tolvaptan in patients hospitalized for worsening heart failure. JAMA 2007;297:1319–31.
. Ultrafiltration versus intravenous diuretics for patients hospitalized for acute decompensated heart failure. J Am Coll Cardiol 2007;49:675–83. Publication Committee for the VMAC Investigators (Vasodilatation in the Management of Acute CHF). Intravenous nesiritide vs nitroglycerin for treatment of decompensated congestive heart failure: a randomized controlled trial. JAMA 2002;287:1531–40.
. Intravenous nesiritide, a natriuretic peptide, in the treatment of decompensated congestive heart failure. Nesiritide Study Group. N Engl J Med 2000;343:246–53.
. The effect of KW-3902, an adenosine A1 receptor antagonist, on renal function and renal plasma flow in ambulatory patients with heart failure and renal impairment. J Card Fail 2007;13:609–17.
. The effects of KW-3902, an adenosine A1-receptor antagonist, on diuresis and renal function in patients with acute decompensated heart failure and renal impairment or diuretic resistance. J Am Coll Cardiol 2007;50:1551–60. Competing interests WHWT has received research grant support from Abbott Laboratories, and has served as a consultant for Amgen Inc., Merck & Co and Medtronic, Inc. WM has no competing interests to disclose.